Railpictures.ca - A.W.Mooney Photo: Around when this photo was snapped, CP was leasing an amazing 200+ locomotives. 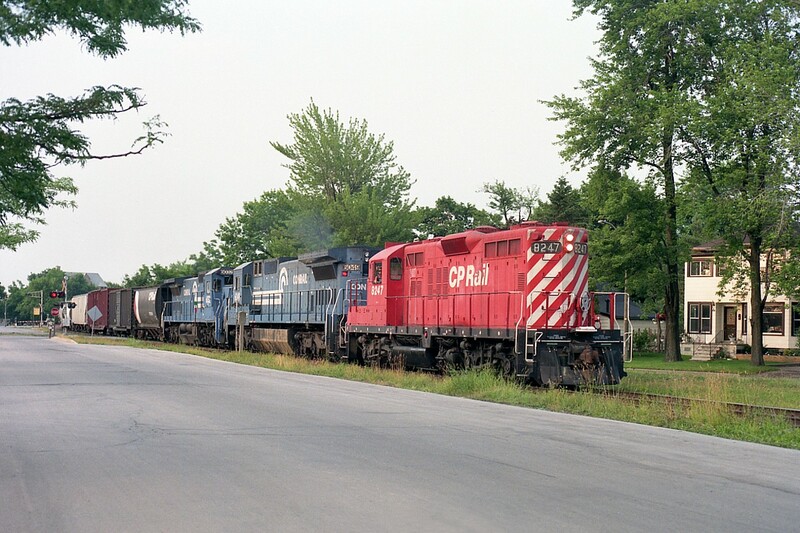 Included were a handful of Conrail C40-8s. I saw very few of them and apparently they were not on the property very long. All returned not long after I caught CP 8247, CR 6049 and 6032 bringing CP #521 from the USA en route to Toronto. In this scene the train is rolling parallel to Elizabeth Place, a short roadway just south of Queen St., which is protected by overhead signals as seen in the background. Time is late day, after the dinner hour. These were “heady” days for the fans. | Railpictures.ca – Canadian Railway Photography – photographie ferroviaire Canadienne. Caption: Around when this photo was snapped, CP was leasing an amazing 200+ locomotives. Included were a handful of Conrail C40-8s. I saw very few of them and apparently they were not on the property very long. All returned not long after I caught CP 8247, CR 6049 and 6032 bringing CP #521 from the USA en route to Toronto. In this scene the train is rolling parallel to Elizabeth Place, a short roadway just south of Queen St., which is protected by overhead signals as seen in the background. Time is late day, after the dinner hour. These were "heady" days for the fans.